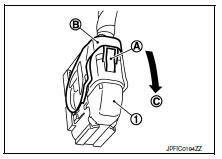 Disconnect ABS actuator and electric unit (control unit) harness connector (1), follow the procedure described below. Move the lever (B) in the direction (C) until locked. Disconnect ABS actuator and electric unit (control unit) harness connector. Loosen flare nut of brake tube using a flare nut wrench, and then remove brake tube from ABS actuator and electric unit (control unit). Refer to BR-25, "FRONT : Exploded View". Remove ABS actuator and electric unit (control unit) and bracket. Remove bracket and bushing from ABS actuator and electric unit (control unit). When replacing with a new ABS actuator and electric unit (control unit), do not remove the protector of the brake tube mounting hole until right before the brake tube is installed. When installing brake tube, tighten to the specified torque using a flare nut torque wrench so that flare nut and brake tube are not damaged. Refer to BR-25, "FRONT : Exploded View". Do not remove and install ABS actuator and electric unit (control unit) by holding actuator harness. Bleed air from brake piping after installation. 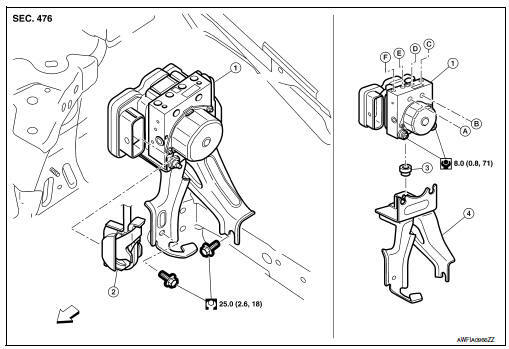 Refer to BR-17, "Bleeding Brake System". Do not apply excessive impact to actuator, such as by dropping it. 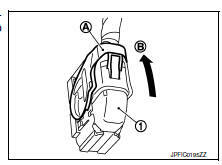 After installing the ABS actuator and electric unit (control unit) harness connector (1), move the lever (A) in the direction (B) to secure the locking.